Betsson is one of the many multi-talented gambling operators that populate the internet. Offering everything from sportsbooks to bingo, a good poker room is at the core of their business. They originate from Sweden but, like many successful gambling corporations, have moved their operations to Malta. Since its founding in 2002 they have been listed on the Stockholm stock exchange and became the first company to open a non-government-owned betting shop in Sweden. In 2004 they made the decision to pool their resources with some of the other medium-sized rooms and joined the OnGame network. Sharing a player base with the likes of Mansion Poker, EuroPoker and PokerRoom swells their connection base to an average 30,000 per day. Any player at any skill level will be able to find a suitable game at Betsson Poker, although the choice of stakes is not the widest. Tables start at $0.05 – $0.10 at the low end for No-limit Hold ’em and the high rollers may balk at the $50 – $100 ceiling. However, for the vast majority there are enough options to satisfy. The high stakes Limit Hold ’em player, by contrast, is well catered to: tables reach as high as $500 – $1000. As you might expect it can be a struggle to find a high stakes game at off peak times – with things dwindling down to the region of 15 tables running at once. Low and medium stakes tables, on the other hand, are always in good supply and the enterprising player should have no trouble finding a suitable No-limit Hold’em table. Other games are on offer for those looking to broaden their horizons or capitalize on their edge. Omaha, Omaha Hi/Lo, 7 Card Stud, 7 Card Stud Hi/Lo, and 5 Card Draw are all available for play. Unfortunately, for those looking to spread their wings, it is difficult to find a table at any stakes for these games aside from low-limit Omaha. The tournament side of the equation is a similar story. Sit and Go ranks start from a very modest $1.00 + $0.20 and increase to the heady heights of $500 + $25. The scheduled multi-table tourneys begin at the same low level but only increase to $100 + $8 for the standard daily varieties. Those looking for greater value should seek out the monthly ‘Royal Tournament’ where a $1000 + $40 buy-in will give you a shot at the $750,000 guaranteed prize pool. Its smaller brother also runs every Sunday, offering a $150,000 guaranteed prize pool with a $300 + $20 buy-in. Both tournaments and cash games are quite popular and there are always a lot of Sit and Goes running. Players seeking that immediate tournament fix will be able to quickly satiate their desires at most Sit and Go levels. However, the crowds start to thin out as you approach $100 + 8. The MTT tournaments are slightly less popular, with most fields coming in at around 400-600 players. Just as with any online poker provider worth its salt, Betsson offers a point system to reward the most diligent players. The system itself is very simple: for every $0.10 raked 0.1 points are awarded. Once accumulated, the points are of limited value; they’re most serviceable when used to clear bonuses. However you are also awarded special freeroll tickets as long as you have earned the requisite amount of points. With 200 in a week you will get a shot at the weekly $2,000 added freeroll, whereas 1000 in one month will allow you to play in the monthly VIP Freeroll with $10,000 added to the prize pool. 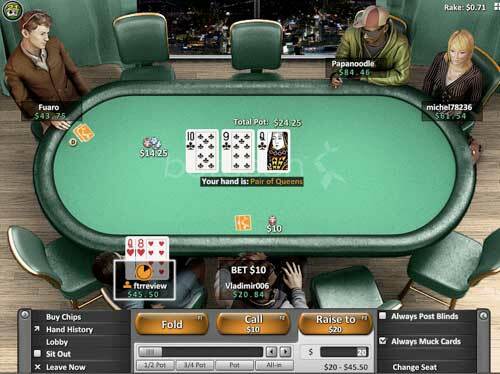 The Betsson Poker software comes as a downloadable program which works natively on both Windows and Mac, so compatibility shouldn’t be a problem. If you’re a linux user or you prefer not to download too many files to your computer, you’ll be happy to hear that a java Instant Play interface is also offered, allowing you to play directly in your browser. While this is perfectly useable, we recommend downloading the proper client if you are serious about playing. Once installed, the interface is clean and clear with a pleasant orange and green theme. After starting up and logging in you are immediately presented with a quick seat function which, with a few clicks of the mouse, will whisk you away to a table. Most of us, however, are more akin to trawling the table list and such a list is on offer once you navigate away from the quick seat screen. Anyone who has used an OnGame network client before will be familiar with the majority of the layout. Large buttons run across the top of the screen, allowing you to choose between Cash Games and Tournaments. Tabs then divide the different types of poker game and selecting one will reveal all current tables for that particular game. Above the table list, drop down boxes allow you to filter between the style (Limit or No-limit, for example), stakes and table size. The set-up is practically the same for ‘Tournaments’ as it is for ‘Cash’, with buttons for Regular, Qualifier, Restricted, Specials and All replacing the drop down boxes. The table lists display all the information you have come to expect (name, size, avg. pot size, etc.) in a simple format any online poker player will be accustomed to. The tables themselves are also reminiscent of the standard OnGame design although, in a nice twist, the ubiquitous 3D PokerRoom avatars have been replaced with newly designed versions. 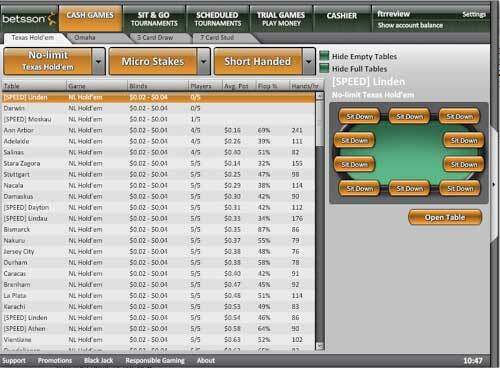 The cards and betting totals are clearly displayed at all times and all the buttons, chat, and check boxes are collected in a shaded area below the table. To build the tension during all-in moves the percentage of a particular hand winning on each street is displayed above the cards. Another useful feature is the small pot size buttons that appear under the betting slider. These enable you to quickly jump to particular fractions of the pot most commonly used as a means of calculating bet size. Although the maximum amount of tables allowed at one time is four, there is a mini view available for those who like to able to see all the action at once. Despite no longer allowing US residents onto their sites, the OnGame network has a healthy player base. Low limit cash games and Sit & Goes are bursting at the seams during peak hours and you won’t need to look far to find a game. In the quieter hours there can sometimes be a long wait for a SnG table to fill up, but there are always plenty of cash games running in the interim. If you’re looking to time your play around the periods of highest traffic then your best bet is to jump in around the 4pm ET (9pm GMT) mark. If Ongame is known for one thing, it is the schools of Euro fish that pool around their software. Some of the hands you see posted in our forums from skins like Betsson are pretty humorous to say the least! So basically, there are fish and plenty of them at Betsson. Of course you will run into some regs while playing, but with some good table selection you are sure to find large amounts of fish that populate the network. Here at FTR, we recommend using bonus code OPOKER1000 for the best balance between size, clearing rate and time allotted for earning the bonus. Remember, these bonuses only pay out the entire amount once you’re fulfilled the whole points requirement, so you should choose a bonus that you will be able to clear at the stakes and games you play. As you play at Betsson, you’ll get 3.6 Player Points per dollar of rake generated or tournament fees paid. This means that with the OPOKER1000 bonus code, you’ll be achieving a hefty cashback rate of 45%! Some of the other bonuses only clear at a rate of 36% rakeback, which is sill respectable. Besides a boatload of bonuses, Betsson also offers up free money via monthly rake races. Basically, the more you play, the more money you get. Your frequent play will also contribute towards your level in the Betsson Poker Club. You’ll get bonus points, which will increase the higher you reach in the Club, and you’ll be able to exchange these points for cash, bonuses, tourney tickets, and more. At SuperPro level, you can achieve returns of approximately 40% rakeback equivalent! Click here to join Betsson! Betsson’s support is easy to find, either from the large button at the top of the client itself or from a link on their webpage. All popular flavors of support are on offer. A live chat box will get your questions answered by a representative in real time, a phone line will allow you to talk to an operator for more detailed enquires, and plain old email is always the simplest option. In our experience their email responses were very swift, often under 30 minutes. A modest FAQ is available to answer the most basic and commonly asked questions.